We have almost been in our current home for four years. Our mailbox has been looking as if it was going to topple over at any moment all four of them. We don't really see it that often because it is at the end of our long driveway, so therefore it gets ignored. Well with the beautiful spring weather we decided to make improvements to it. Here is the mailbox before after we easily pulled it out of the ground. The wood at the bottom had rotted away at the end of the post and that it was why it was leaning forward. I always assumed we were helping our postal worker by leaning the box towards their truck for easier access. Rob and I decided that the post could be saved. He sanded it down and then we applied a decking and wood stain that we had left over from a previous project. The best part was our old flag was gray...now that is some serious weathering. I am assuming that our mailbox is about twenty years old like our house. I snagged a new flag from Lowe's for about $3.00. 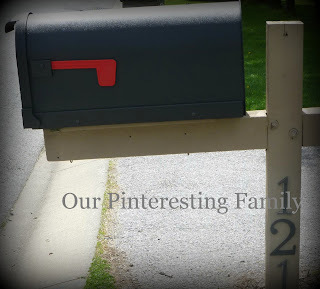 We had some black spray paint meant for plastic in our garage so Rob gave the mailbox a facelift. We added some new numbers to the post and placed it back in the same spot as before. We added some additional pieces of wood where the post had previously rotted. For the most part it was in good condition and we did not feel it needed to be 100% replaced. I think this will make the neighbors happy too. All other materials were already purchased for other projects.. Funny what a difference a little thing like a mailbox update can make. I notice people's mailboxes all the time. Curb appeal really does start at the curb! You are so right, Sharon. :) We are excited about such a small change. Stopping in from the Sunday Blog Hop!! Can’t wait to see what you have been up to this week!! This weeks linky party is now up ! !